“God bless you sir, Take another road and avoid this bridge; it might collapse’, said Ismail to the taxi driver as he wanted to pass across the bridge leading to the Nabi Younis area. 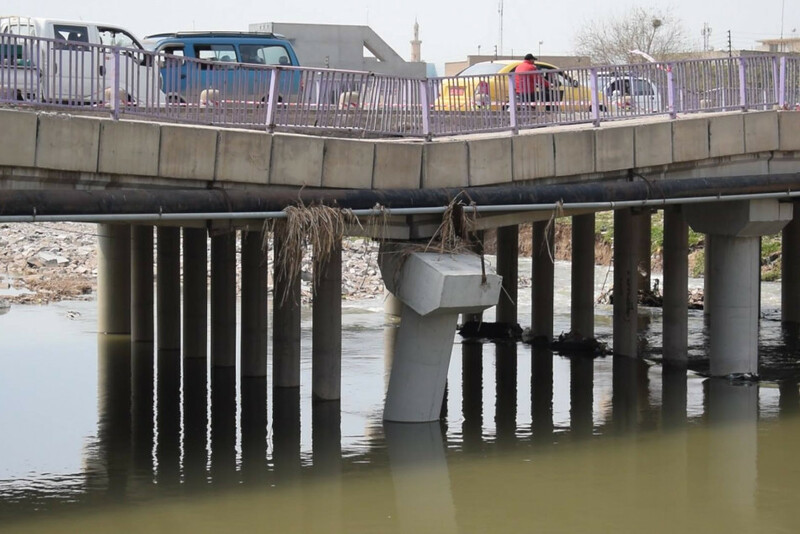 Swes Bridge is one of several other bridges in Mosul which have been affected by the recent flooding caused by heavy rainfall and are in danger of collapse. According to eyewitnesses and activists, Mosul is on the brink of another disaster that could be even more catastrophic than the March 21, 2019’s ferry accident which left an estimated 200 people dead, the bodies of dozens of them remain missing. The fears emerged after heavy rainfall and flash floods inflicted severe damage to main bridges including the Swes Bridge. Some of the bridge’s pillars and steel piers have been badly damaged. Swes Bridge, built over Khawsar River on the western side of Mosul, was bombed by coalition forces during the war against the Islamic State (IS) group. The bridge was rebuilt in 2018 by a private company funded by international donors. The first phase of the project included the construction of a temporary bridgeway for vehicles but it collapsed due to heavy rainfall. “The contract was a sort of corruption; it is totally illogical to hand such a significant project to a company during this rainy season”, says Mam Talal. Mam Talal, the taxi driver whom the passenger asked not to take the bridgeway said, “These people think of nothing but looting this city”, referring to local officials. Ninewa’s human rights commission earlier on March 23, 2019, in a statement, warned of a humanitarian disaster in Mosul indicating that the Swes Bridge is vulnerable to collapse. The recent heavy rainfall has caused damage to several other bridges in Mosul, some of them were rebuilt less than a year ago. The Iraqi ministry of reconstruction issued a statement with regard to the Swes Bridge in which it emphasized that the bridge will be restricted to small vehicles only. The statement indicated a special committee which includes representatives of the directorate of roads, UNDP and Mosul University’s advisory office has been formed to examine the damages being inflicted upon the bridge. The ministry stressed that trucks will not be allowed to use the bridge until the project is completed. Five main bridges over the Tigris link east and west Mosul, while smaller bridges span the Khosar River, which runs through eastern Mosul. All these bridges were bombed by coalition fighter planes in the battles to retake the city from IS. “These bridges are just like the ferry. They could fail at any moment and lead to a catastrophe”, says civil society activist Bandar Agidi.